I try, I fail, I try... ... and this continues ... till I succeed. languages a Map is known with names such as dictionaries, hash table, associative array etc. In the adjoining image here, we have a table that stores Key and Value pair. What are the values for key B? By looking at the above image (table) you can easily derive that there are two set of values Name & Example. For key B the corresponding values are Name = Blue & Example = Sky. In a Map, values (data) can be retrieved very fast by providing the corresponding key. At the end of this post we'll see how we can represent the above image (table) with the help of a Map. This should be read as the variable color is a map of string keys to string values. Use of make function ensures that memory is allocated for the Map named color as Maps are Reference Types. The above looks similar to simple Arrays with a little difference that Maps are dynamic in nature i.e. new items can be added to it. Another difference is that unlike Arrays which are sequential, Maps are NOT sequential. The above declaration is rewritten below with an added second argument that defines initial capacity of the Map. In below declaration 3 is the initial capacity (Size) of the Map named color. The capacity of a map doesn't have to be known at creation. But for performance reasons, it is a good practice to specify the capacity even if it's an approximate number. Play with the above code here. OK. That was quite simple. 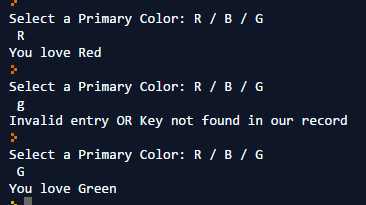 Now, let us modify the above code to get the user's favorite color as an input. Here Scanf function from the fmt package is used to read the user's input. We can see from RefCode# Map 1.2 that  only 3 key-value pairs: R, B, G (case sensitive) are present in the Map. 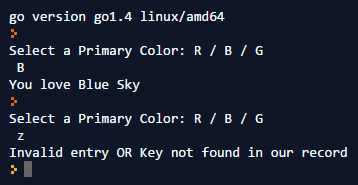 What happens if a user enters any other key except R,B or G? How to check the existence of a a key? isOK returns a Boolean value true only if the key is present in the Map else it returns false. The other variable value contains the actual value/data of the corresponding key of the Map. It returns You love Red. If you enter g as key; isOK will return false as we don't have any value corresponding to the key g (case sensitive). G will retrieve a valid data as shown below. "R": "Red",  //Did you notice the comma? Let us see an example of a Map where we have more than one named values/data for a single key. Please share if you liked it.